Officers made several arrests on Monday night as the violence escalated. Egypt’s Ministry of Foreign Affairs has called for the United States authorities and all parties to exercise restraint amid intensified protests over the killing of a black American teenager in the Missouri town of Ferguson. In a statement, the spokesperson of Egypt’s Ministry of Foreign Affairs echoed earlier calls by the United Nations Secretary General Ban Ki-moon to exercise “restraint and respect for the right of assembly and peaceful expression of opinion,” adding that Egypt is closely following the “mounting protests” in Ferguson. The statement also quoted the Secretary-General, urging a full investigation to reveal the ‘full light on the killing of the American teenager’ in order to achieve justice. The latest statement by Egypt echoes similar statements by the United States calling on Egyptian authorities to exercise restraint and to respect the right of people to freely and peacefully assemble. Egypt’s relationship with the United States has been strained since the ouster of deposed President Mohammed Morsi. The US, which has unofficially considered Egypt’s ousting of Morsi as a coup, had temporarily frozen military aid to Egypt in protest to ‘an undemocratic’ atmosphere. Egypt’s President Abdel Fattah Al-Sisi recently rejected an invitation to attend the first US-African Summit in Washington DC, held earlier this month. The newly elected President, who was only invited three weeks before the event, sent Prime Minister Ibrahim Mehleb in his place. Amid escalating tensions, Missouri Governor Jay Nixon had declared a state of emergency and a curfew in Ferguson, deploying the National Guard to assist with the lifting of the curfew on Monday. US police have arrested at least 31 during the latest night of angry protests in the town of Ferguson. Police and protesters have clashed on multiple occasions, with heavily armed police forces firing tear gas and rubber bullets to disperse the protesters. Police Captain Ron Johnson defended the police’s use of tear gas, stating that officers were attacked with Molotov cocktails and bottles. 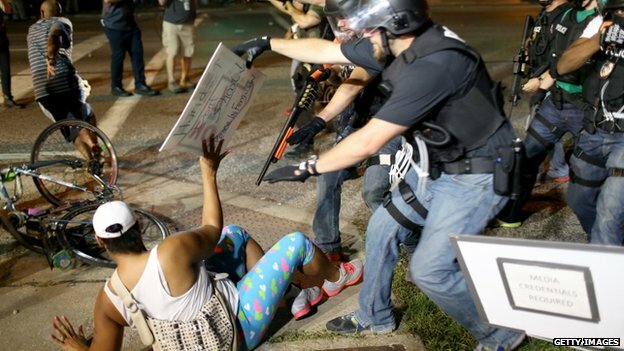 However, activists have condemned police tactics in Ferguson as ‘aggressive.’ At least three journalists have been detained in the past week by police while covering the demonstrations. “The US can’t tell other countries to improve their records on policing and peaceful assembly if it won’t clean up its own human rights record,” tweeted Amnesty International in a strong condemnation of the response towards the demonstrations in Ferguson. US President Obama meanwhile stated that he is closely following the “passions and anger” provoked by the killing of Mr Brown, adding that there is a “gulf of mistrust” between locals and law enforcement.